I honestly don’t think I’ve ever met another human being who doesn’t like Oreos. They’re especially a favourite in the Bespoke Bride office since our trip to California where we pretty much ate them for breakfast every morning! (no joke…we bought the multipack.) 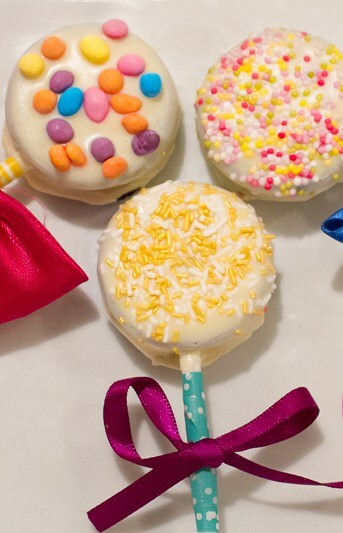 Now i’m all for dunking my Oreos in tea and all that but I’m also a sucker for any sort of food on a stick…so Oreo pops pretty much make the world a better place in my eyes! And your eyes. I can tell. These are the perfect party addition, cute present or they make awesome wedding favours! Just pop a plastic bag over them and tie it up with a pretty ribbon! Step 1: Twist off the tops of the Oreos. Step 2: Melt 50g of your white chocolate and dip one of your sticks in. Step 3: Using the chocolate as a glue, place the stick to the creamed side of the Oreo. Step 4: Pop the other half of the Oreo back on and leave for 20 minutes while the chocolate sets and sticks it all together! Step 5: Melt the rest of your chocolate in a tall thin glass, make sure it’s wide enough to fit the cookie in though! While you’re waiting for the chocolate to melt, cut out a piece of baking paper and pop it on a baking tray. Step 6: Once your chocolate inside the Oreos has set and your other chocolate has melted, carefully dip your Oreo stick into the white chocolate until it’s completely covered. Step 7: Place it on the baking paper in the tray and decorate however you like! Then continue until all the cookies are covered and pop in the freezer for 5-10 minutes. Step 8: Now that the chocolate has hardened in the freezer, take a pair of scissors and cut off any chocolate that’s hanging over the edges. Step 9: Pretty up your stick with a little washi tape! Step 10: Add any bows or ribbons you like! Now, quick! Go whip up a batch! Or you know…just attempt to keep them in the fridge until your wedding day arrives! These look yummy, definitely bookmarked for this weekend! Oooooh, this must be so good! Def gonna give this a try! Love these! Do you know how far in advance you can make these? Glad you like them! I would probably say 1-2 weeks but they would need to be stored in an airtight container to maintain their freshness. These are so cute. I will be attending a convention in Hawaii and would love to hand these out. The place has A/C but I wonder how long they will last without melting. Do they melt easily? Hi Sara, we didn’t hang around long enough to find out as they were so delicious but I would imagine they would last a good few hours, maybe not all day though? Looks easy to do. Thanks for the tip. Will it melt if it’s in room temperature? Making these next month for our daughters christening, cannot wait to see how they turn out!! Im making them for my kiddies stall at a market 😉 How do you melt the white chocolate in the glass? We didn’t melt the white chocolate in the glass, we melted it in a pan on the hob and then poured it back into the glass after. Hi, I would like to know how you melt the chocolate?, since you have it in a glass. others I’ve seem have you melting chocolate on the stove. I really wasn’t feeling that method! We did in fact melt the chocolate on the stove, we then poured the melted chocolate back into the glass for this photo. Do they work dipped in regular milk chocolate? ? Hello, looks great… my question is when lay them down does the chocolate come off the back? Hi, these look amazing and super cute! I was just wondering if there is any specific white chocolate we had to buy? Or is any kind okay? And is there a special trick to melting it on the stove top? Or do i just throw it in and turn up the heat? Any white chocolate will do. When melting the chocolate, keep it on a low heat and melt gently. Hello! I’m interested in making these for my,daughters baby shower. Do tiunthinkmitsmokmtomout them in individual plastic bags and store in the freezer or refrigerator in advance. THANKS. I think that will be fine!